There are many things I have long forgotten from primary school education, especially when it comes to social studies. However, I can clearly remember the teacher instructing me to memorise back in 1994 how “Malta has a population of 330,000”, which is probably the figure presented in the 1985 population census that is revised every decade. I never quite grasped the magnitude, or ‘minitude’, of the size of Malta and its population until recently. 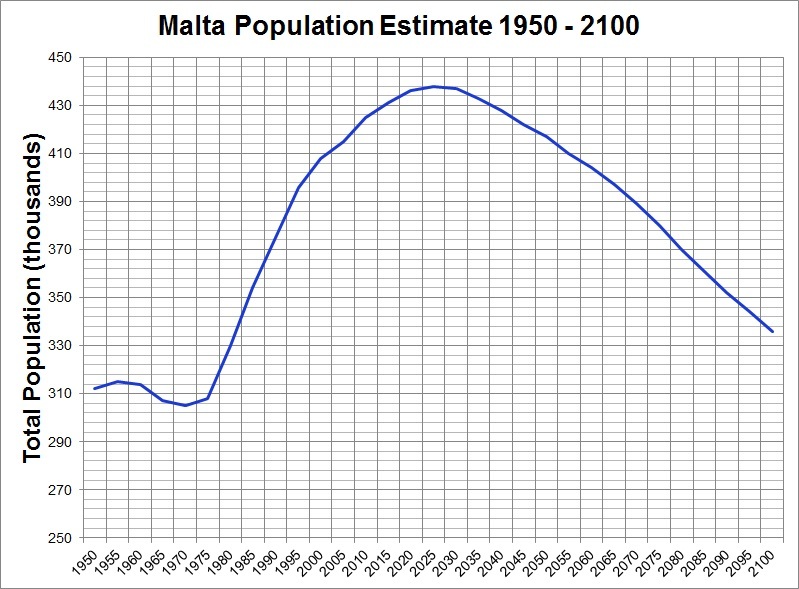 With a population size that doesn’t seem to want to slow down, I ponder on the possibility of Malta achieving a population of 500,000 sometime in the future. I have recently came across several Ted Talks by Hans Rosling, a celebrated Swedish academic and statistician who has given numerous public talks on changing population trends in relation to factors such as fertility rate, poverty, religion and economic development. In October 2011, the world population hit 7 billion, and the UN is forecasting it to reach 11 billion by 2100, after which there is a possibility of it increasing, decreasing or stabilizing. According to Rosling’s talks, and a recent programme that aired on BBC2 which I happened to attend (happy geek alert! ), the next century will only see a major growth in Asia (1B) and most notably in Africa (3B). The Americas (North and South) will not see any major increases, while Europe will actually exhibit a decline in population due to lower fertility rates and an ever aging population. 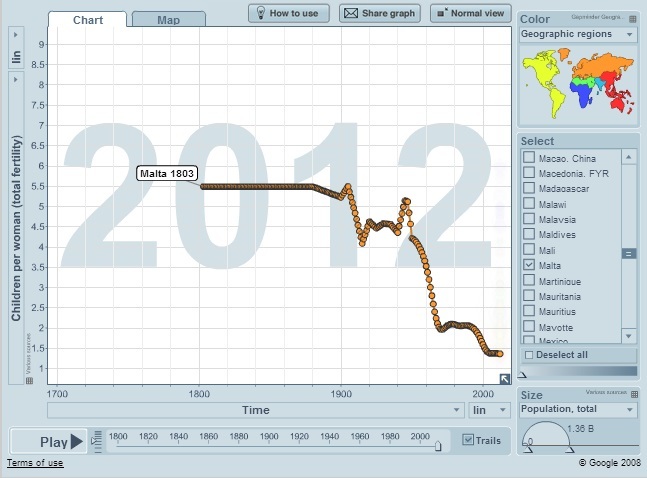 While I was observing Hans Rosling work his statistical magic with exquisite computer representations and complex global information (see example below), my mind tapered off and started thinking about Malta’s fate since it also is a European country. As can be seen from the UN estimates, Malta will most definitely NEVER have a population of 500,000 people– so close yet so far! In fact, it is going to poetically slump back down to just above 330,000, similar to how they used to teach my generation in primary school. Will there be some large scale emigration wave similar to the post war repatriation which saw 30% of the population leave the country? Or will there be some earth shattering cataclysmic event that will kill off thousands of people? What this graph illustrates is a direct result of a combination of declining/stabilising total fertility rates (in terms of children per woman) and an ageing population (a higher life expectancy). During the 21st Century there will be a smaller or constant number of children being born due to a declining/stabilising total fertility rate. This means that there will be no ‘extra’ people added to population other than the ‘fixed’ number of children born every year. In 2025, Malta reaches an estimated peak population of 438,000. As such, in 2025 the Maltese population will mainly consist of numerous people who are living longer, with the bulk of the population being in the 40-60 and 60+ range. After 2025, the older generation will start dying off with no new children being born to replace them, so the population will slowly decline to the point at which birth rate and death rate eventually become balanced again. As such, most of the people reading this blog entry can come to the realization that they are living in the ‘golden age’ of our country’s demography, where they are part of the largest population to ever call this little rock in the Mediterranean home! “Yes I went there with my wife on holiday. 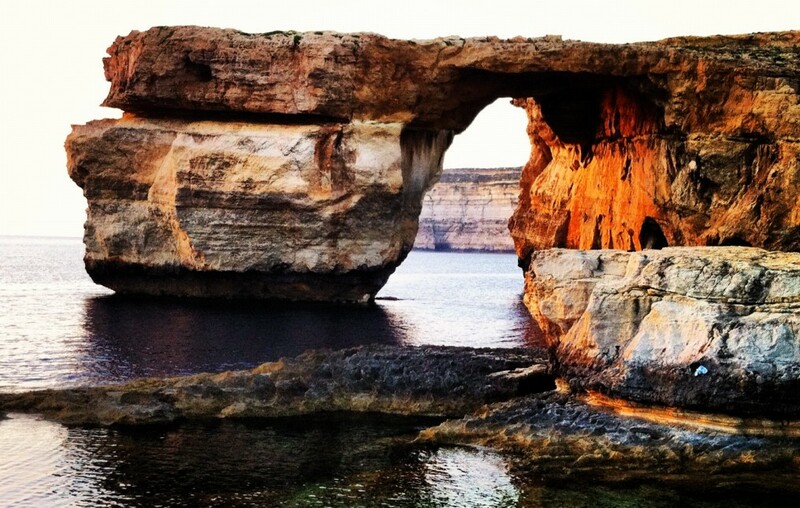 I was very interested in your language and Arabic roots, I liked Malta a lot”. I left the BBC studio a more informed and patriotic individual. Thank you Hans!